1. High quality and high reliability. 2. LOW Noise < 0.2UV，LOW T.C.R TO 1 5PPM 、 25PPM 、 50PPM. 3. High precision ±0.1% 、 ±0.25%、±0.5%、±1%. 4. Excellent long team stability. 1. Available on buck tape/reel. 2. 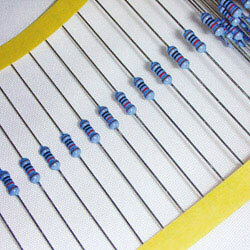 Precision metal film fixed resistors (MF).